UNQUANTIFIABLE is 10 performers expressing the me, them and other. The personal satisfaction of one’s own voice divides, only to form a full melody in the net of time and space. UNQUANTIFIABLE is 10 performers expressing the me, them and other. The personal satisfaction of one’s own voice divides, only to form a full melody in the net of time and space. As one observes, the unconnected things begin to connect. The connections are by coincidence and become intentional as the phrases of movement and music catch on one another reveling in the harmony. The dancers can hide in plain sight, take an unswerving strong path, crisscross in confusion, and meld in amoeba form. Musicians will move throughout the space using wireless pickups to play an “electro-acoustic score” mixed and created by Loren Dempster. When is unison confining and when is it fulfilling? When does being alone make one feel safe or conversely vulnerable? When does a complex group eliminate inclusion of others or even audience? How do the performers invite the audience in with proximity and focus? When trying to survive (or enjoy) a crowd, when does one yield or need to stand their own space? 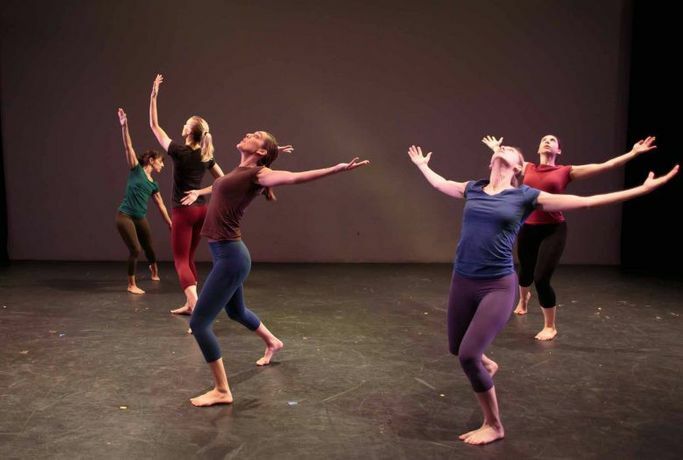 Performers claiming their own space or yielding to others will reflect the many possibilities of individuality and interconnectivity by using movement and sound. The audience will leave with a heightened awareness of their fellow humans that make up their environment. This dance is a celebration of our uniqueness coexisting in harmony. Bethany Logan, and Diane Skerbec.